Baabal Maal: "African music is more than men pounding on a djembé"
Actor Sotigui Kouyaté from Mali was awarded the 'Officier des Arts et des Lettres' medal during the 62nd Cannes Film Festival by the French Ministry of Culture. 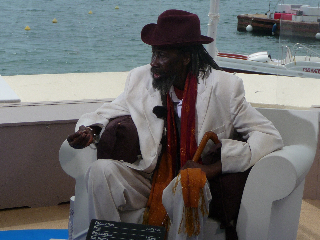 Only a few months earlier Kouyaté won the Silver Bear for best actor at the Berlin Film Festival. Kouyaté lives in Paris but often travels to Africa to organise projects: "I want to be involved in my continent. I have already directed two stage plays: Antigone and then Oedipus, which we played in Mali, Burkina Faso and Niger. I am currently working with Salina by Laurent Gaudé. Hopefully it will tour Africa." Yet again a French text tailored to the African situation. Kouyaté has his own views on cultural exchange. "When directors stage European plays with African actors who speak French, there is no exchange. What I do is present a French text in an African context, and the language is adjusted accordingly." Because West Africa has no theatre infrastructure, Kouyaté is continually starting at the very beginning. Which means that he always needs to modify texts and train actors. Being a natural optimist, he sees no reason for a fatalistic view of the development of African artists. "Of course it is an enormous task, but it is not impossible. People say that Africa is poor. That is not true. Africa needs to be poor. That is what is wanted. Professional or amateur: what counts is what you yourself want. If a snake is coming at you, you must defend yourself with the stick you hold in your hands. You must make do with what you have." That is the approach Kouyaté has taken from the very beginning and that has enabled him to become an icon of African theatre. "A good amateur has no reason to take the place of a professional. I had two theatre groups: a stage trio financed by the French embassy and another group that I funded myself." Today, his film work makes it possible to finance his plays. "Simply because I want it to happen."